Don't shop, swap! Save resources and money with the free clothing swap! Every 4th Saturday of the month at 2 pm. 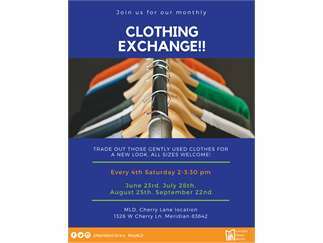 Bring your gently used clothing, shoes, and accessories to trade for new-to-you items. All sizes welcome. Bring some, take some!